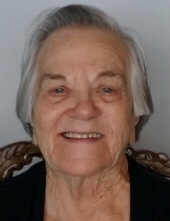 Evelyn Bernice Atchison, daughter of the late Orvle and Pearl (Alexander) Atchison, was born March 20, 1936, in Douglas County, near Macomb, Missouri, and departed this life on January 20, 2019, in Mountain Grove, Missouri, at age 82 years and 10 months. She grew up and attended school at Hickory Flat, Missouri, Exeter, California, and Norwood, Missouri. She also attended Draughon’s Business College for two years in Springfield, Missouri. Evelyn worked in Rogers, Arkansas, and then moved to Iowa where she spent twenty-five years at Alcoa Aluminum Corporation in Bettendorf, Iowa. After she retired from Alcoa as a lab technician, she bought a home in Mountain Grove, Missouri, and lived there until the last eight months where she resided at Autumn Oaks Caring Center. Evelyn had a lifetime association with the Assemblies of God Churches where she lived. She was a great supporter of missions and evangelism. Evelyn enjoyed traveling and being with her family. She loved family meals and even compiled and printed her own cookbook. She loved visiting and reminiscing with her family and friends. Evelyn was always a giver and a caregiver. She was blessed by what she could do for others. She will be greatly missed by her friends and her family, who knew her best. Besides her parents, Evelyn was preceded in death by four brothers: Paul Atchison, Silas Atchison, Arthur Atchison, and Noah Atchison; and four sisters: Rachel Babcock, Ruby Atchison, Dorothy Atchison, and Marie Douglas. She is survived by two brothers: Kenneth Atchison of Van Horn, Texas, and Dewey Atchison and his wife, Shirley, of Branson, Missouri; one brother-in-law: Ernest Douglas of Springfield, Missouri; one sister-in-law: Louise Atchison of San Luis Obispo, California; and several nieces and nephews. To send flowers or a remembrance gift to the family of Evelyn Bernice Atchison, please visit our Tribute Store. "Email Address" would like to share the life celebration of Evelyn Bernice Atchison. Click on the "link" to go to share a favorite memory or leave a condolence message for the family.